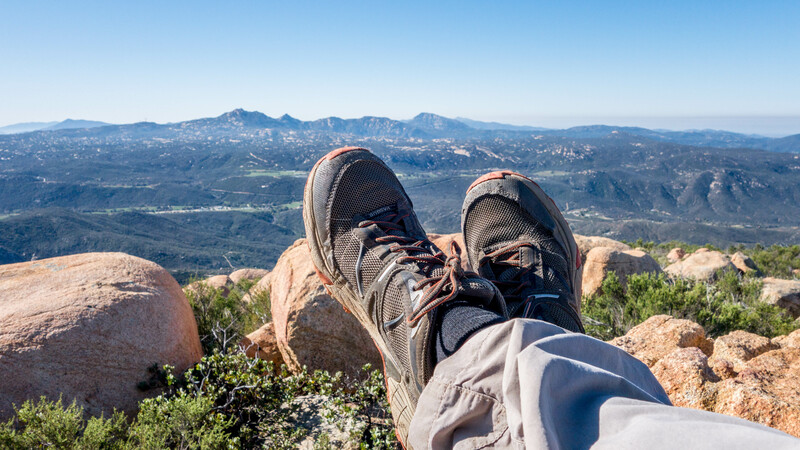 When I started my journey of hiking San Diego’s 100 highest peaks, I was naïve. I assumed that each peak would have a well-worn path leading straight to the summit. My plan was to challenge myself by breaking my old routine and waking up early to hit the trails for some exercise and peakbagging. Note that I said, “hit the trails.” I never imagined that there might not be a trail to hit. 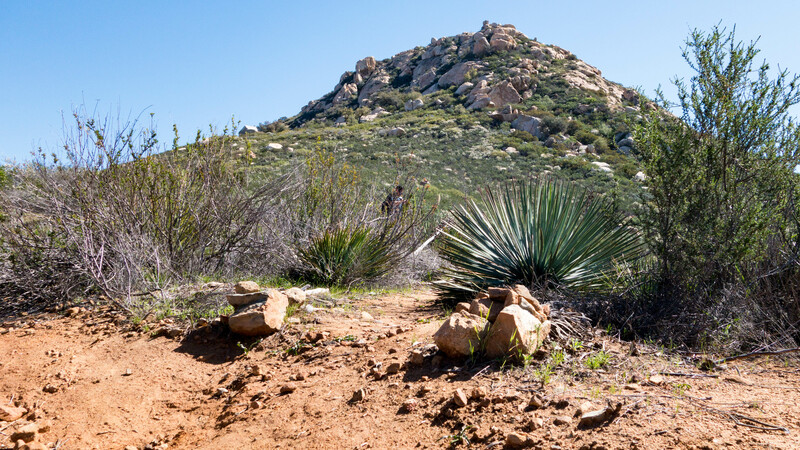 Afterall, I’d hiked several peaks on the list already, like Mount Woodson, Iron Mountain and Cowles Mountain, all with well-groomed trails. My new routine was simple – wake up early, hit the trail, hike straight up, run straight down, return home, eat, sleep and repeat. Simple, right? Not quite, as it would turn out. Most of the trails I’ve hit recently, including Middle Peak, Pine Mountain, Lawson and Gaskill Peaks, have all tested me in ways I had never expected. And with an assortment of bushwhacking, route finding and class 3 rock scrambling, Bell Bluff is just the latest hike to offer up a challenge. 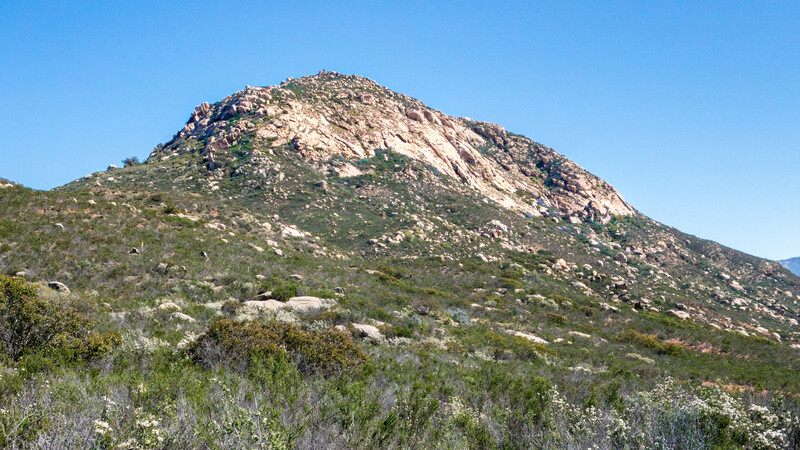 Bell Bluff is one of several prominent peaks located around the town of Alpine, Ca. The hike starts off from an unassuming trailhead tucked away along a quiet neighborhood street. Upon our arrival, we parked off street before crossing again to start our hike. 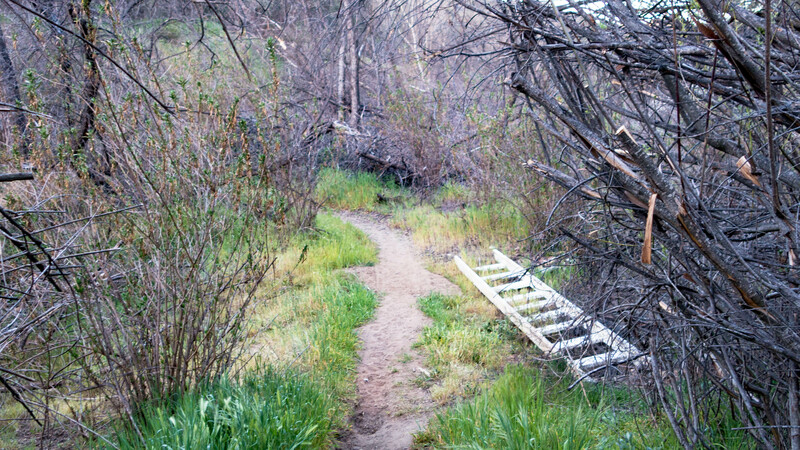 Once past the trailhead gates, the trail takes you down between a couple of private properties towards the Sweetwater River, which was dry when we hiked this trail in late February. There is a ladder to help you cross when the water is flowing, but it’s good to be ready to get a little wet. After crossing the river, the trail begins a slow climb up and out of the valley before taking a turn due east at about 1.2 miles in. We started this hike at 6:30 am and even with sunglasses, the early morning sun was blinding. At times it was difficult to see the trail without holding my hand up to block the sun. 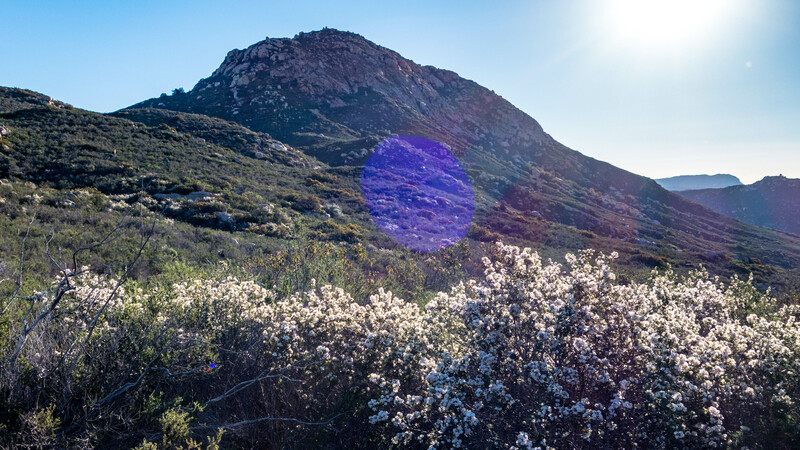 Spring has come early this year, so our hike to the summit of Bell Bluff was full of fresh blooms of wildflowers. Fields of purple California lilac were the most prominent flowers we passed. 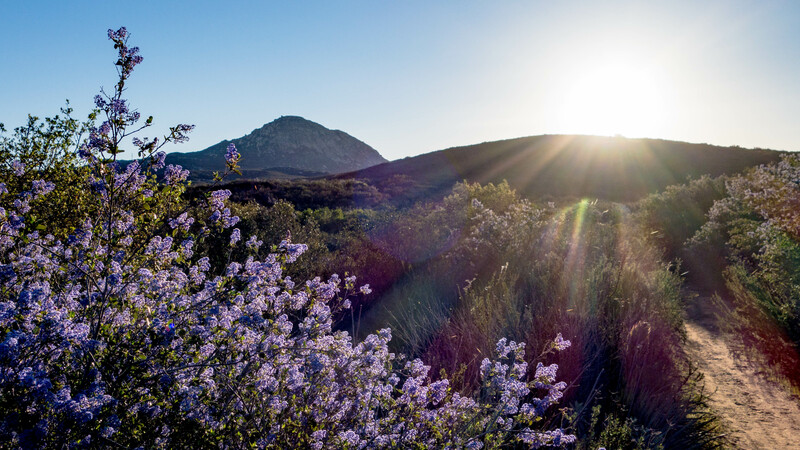 We also came across bright yellow daisies and wild mustard blooms as well as patches of white California buckwheat, and the sweet smell of California sage scrub was everywhere. Approximately 3 miles into the hike we reached the base of Bell Bluff. There is a small cairn-marked trail that goes off to the right towards the peak. Leaving the main trail behind, we hiked in about 50 feet or so to a clearing where we stopped briefly to figure out our plan for getting to the summit. The granite peak is intimidating from a distance, but when you’re standing directly beneath it, the challenge that awaits becomes plainly clear. 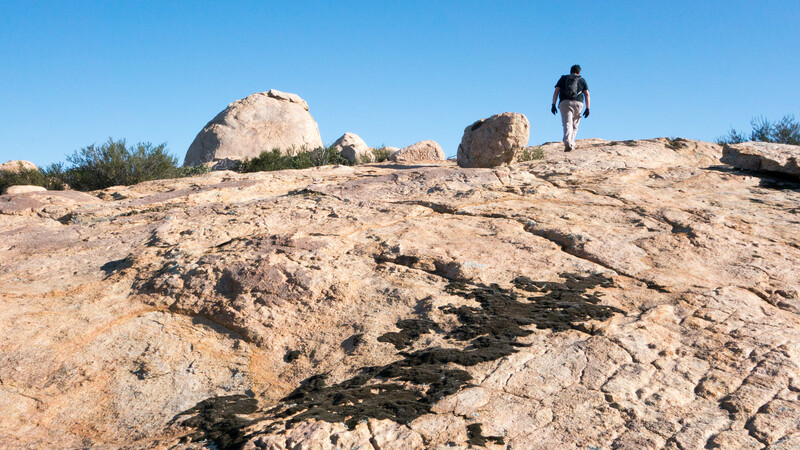 Sheer granite slabs and large boulders surrounded by manzanita trees, yucca trees and other hardy plants covered the hillside. As we wandered around the clearing looking for the easiest approach, we were surprised to discover a light trail leading off into the bushes. Everything that I had read about this hike described difficult bushwhacking and a scramble up the hill to the summit. I wore long pants and gloves and was ready for exactly that experience. The Bell Bluff hike has apparently become more popular since those articles were written, and you can now follow a light trail up the western face to the summit. With our route clear, we set off into the bushes following the trail around trees, brush and boulders. The climb was steady but manageable, and we rarely needed to use our hands as we navigated our way up the hill. The trail was light enough that we would occasionally lose it as we made our way over boulders, only to pick it up again a few yards later, usually because we spotted a cairn. After scrambling for about a third of a mile, the trail opened up and we found ourselves standing on a large, flat granite slab. It was a great spot to take a break and the first opportunity we had to take in the views that were opening up around us. From here, we looked up to what we believed was the summit. Before us was a scramble that was clearly going to be more difficult than the one we had just completed. Fortunately, we once again found the trail leading upwards and set out to make our way to the top. After a quarter-mile and a couple of false summits, we arrived at the top where we found three geological survey markers, a summit register and 360 degree views. 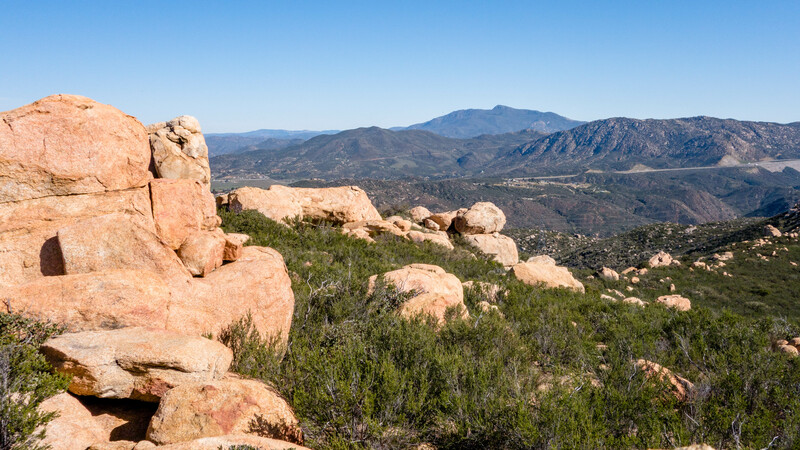 Identifiable landmarks from the summit included Cuyamaca Peak to the northeast, Lawson and Gaskill Peaks to the south, and El Cajon Mountain to the northwest. Although it was hazy and we couldn’t see the ocean, we were able to see as far as Downtown San Diego to the immediate west. All-in-all, the bushwhacking and scrambling were much less substantial than expected, though the long pants and gloves definitely came in handy. The trail that earlier hikers have laid down is easy to follow and extremely helpful. It’s also nice that they have taken the time to clear a path through the bushes, making the summit more accessible than it has ever been.